Is your mind blown? I know mine is. Just reading that makes me wonder how we have managed to fit ALL of that in between work, Trent, Trent teething, a pregnancy, two root canals, our busy social life and everything else. Oh wait, one of those is completely non-existent. I'll let you guess which. Anyway...we are still not done! Do you remember back in the good old days when I was blogging regularly and was going to start a "project of the month"? Well...I guess I am making up for lost time..and more! Somehow, no matter how hard I try to focus on ONE thing at a time, I always seem to end up going way overboard and trying to tackle it all at once. But I think sometimes that is just the way to go! It is definitely going to get worse before it gets better, but it will all be worth it! And the good news is, I took before pictures of all of the rooms! Oh wait, no I didn't :( Mother of God. EVERY. TIME. Despite the lack of before pictures, I still can't wait to share all of the exciting new developments once things get put back together! One major development I can go ahead and share is...drum roll please....we are having a GIRL! Admittedly, I was slightly terrified when we first found out, but with each passing day (and trip to Target), I get more and more excited about being team pink. We will have one of each! And let's face it...there is just an endless amount of ADORABLE CUTENESS out there for girls. I have been so good and have only bought very few things so far, but once the house tornado settles, it is on! 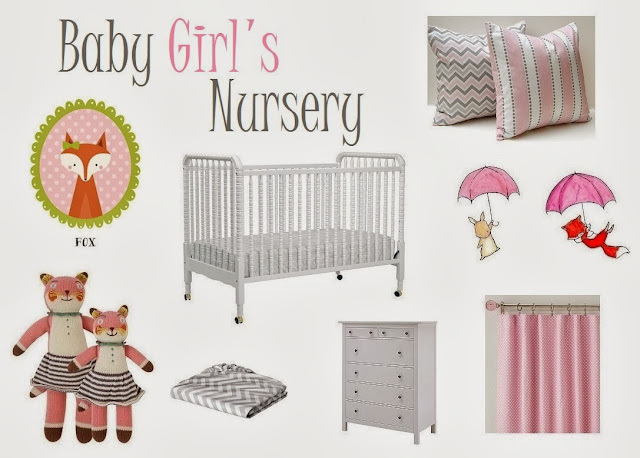 The nursery is going to be pinks, whites and grays with different patterns (polka dots, chevron, etc), and just like Trent has fox and monkey things in honor of his name and nickname, she will have fox and bunny things in honor of her name and nickname. For now, here are a few things we have been collecting along the way and a couple of things I am chomping at the bit to buy. After the paint goes on the walls, we are planning to get things in asap. Preparing for a baby is so much different the second time around when you already have a little one to wrangle. I plan to get as much done as soon as I possibly can! Speaking of, I had better run and get back to work on...umm...ONE of those projects! Next up...Fall is HERE!!!! Sort of. This entry was posted on Friday, September 20, 2013. You can follow any responses to this entry through the RSS 2.0. You can leave a response.